Heroism dwells in the heart of the one who gives. Be a hero this holiday season by sharing what you have to the "real" heroes of this land -- the military men and their families. Since 'tis the season to give, why not make it worth it by making a difference to the lives of others, especially those serving in our armed forces. Support the Sears Heroes at Home Wish Registry. This is a long-standing tradition of Sears to support the military whose sacrifices deserve much recognition. TheSears Heroes at Home Wish Registry program provides support to service members, veterans and their families through joint efforts with various nonprofit organizations. The program allows Americans to connect with the military community on a very personal level, and gives Americans the opportunity to grant their holiday wishes. If you want to know more of this worthy program and read stories from military families around the country, visit Sears Heroes at Home Wish Registry and be part of this endeavor. You can donate and share your blessings, no matter how small it is, it will count and will go a long, long way. This season of giving, think of all the military men -- the living heroes of today. Think of their families and how you could make them smile. The cutie Lenovo IdeaPad S10 netbook is sold for only $399. This great little netbook is good for your basic computer use, email, web and more. 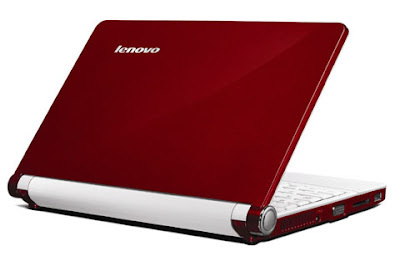 This Lenovo IdeaPad S10 netbook comes with this features. Do you want to be a XML Grand Master? You may have the XML skills, and with the title of XML Grand Master, it will boost your record even further. The first step is to get involved in the The XML Challenge sponsored by IDUG. You will earn participation points for each entry. A special prize will be given to the contestant —- the "XML Grand Master" —- that collects the most participation points. Are you ready to face the IDUG contest and test your XML skills? Apple may be the leader in the MP3 player category, but there are still other brands that may have Apple's features yet may cost less. MP3 products from Microsoft, SanDisk, Sony, Slacker, and Creative are few of the brands you may want to look at this Christmas for your holiday gifts. I listed below the best MP3 players for the holiday season's gift-giving. Apple iPod touch - With iPod touch groundbreaking technologies--including a Multi-Touch screen, the accelerometer, and 3D graphics--and access to hundreds of games, iPod touch puts an amazing gaming experience in the palm of your hand. Amazon discounted prices: 8GB - $208.00, 16GB - $269.98, 32GB - $359.98. Microsoft Zune 80/120 - BEST subscription-based device on the market. One nice feature about the Zune device is that they are easily upgraded. Amazon discounted prices: Zune 120 GB - $224.51, Zune 120 GB Gears of War 2 Special Edition - $268.97. Apple iPod Classic (6th generation) - Available in a 120 GB model that holds up to 30,000 songs, 150 hours of video, 25,000 photos, or any combination. Amazon discounted prices: 120 GB Black - $224.94, 120 GB Silver - $224.95. Microsoft Zune 4/8/16 - It comes complete with a built-in FM tuner and buy-from-FM capabilities, wireless sync, Zune-to-Zune wireless sharing, video playback, and more. Amazon discounted prices: Zune 4GB Video Player Red - $113.81, Zune 8 GB (Black) - $139.84, Zune 16 GB (Black) - $160.51. Apple iPod shuffle - Lets you wear up to 240 songs on your sleeve. Amazon discounted prices: 1GB Silver - $48.72, 1GB New Bright Blue - $49.99, 1GB New Pink - $48.72. Sony E-series WalkMan - The Sony E-series Walkman comes in 8GB and 4GB models priced from US$73 to US$120 so it is a reasonable lower cost alternative. Slacker G2 - The Slacker G2 features a built-in MP3 player. You can store up to 1 GB of MP3s. The Slacker G2 plays all of your Slacker Radio stations on one sleek, ultra-portable player. Amazon discounted prices: Slacker G2 8GB 40-Station - $249.99, Slacker G2 4GB 25-Station - $199.99. SanDisk Sansa Fuze - Listen, watch, and play all day with 24 hours of battery life and room for up to 1,000 songs. Nice mp3 player yet very affordable. Amazon discounted prices: SanDisk Sansa Fuze 4GB - $48.00, 8GB MP3 Player (Silver)- $69.99. Creative Zen X-Fi - Creative Zen X-Fi is the first player to restore the quality of compressed music with award-winning X-Fi Xtreme Fidelity Audio technology. Amazon discounted prices: 16GB Video MP3 Player (Black/Silver) - $164.99, 32GB Video MP3 Player (Black/Silver) - $262.71. Shop now for your holiday gifts. Why use platinum engagement rings? The last years saw the platinum engagement rings becoming popular for couples. Before, gold wedding rings are the only option for couples wanting to have the rings for their marriage. Not anymore, today. Platinum is now eyed to be a better material for rings. Platinum is a metal more prized than gold, and it has some sound advantages over gold as well. The platinum material is a very durable naturally white metal that will keep its brilliant white luster even for many years of wearing. Unlike other materials that give you skin allergies, platinum does not, as it is a neutral material. So if your ring is platinum made, you can let it stay on your finger 365 days a year, for many years and still it will look just the same as the first day you wore it. Platinum wedding rings are fashionable, elegant and practical. There are a lot of online jewelry shops that are offering beautiful platinum engagement ring at very reasonable prices. For those about to marry yet, choose platinum wedding rings. Remember that having a beautiful, long-lasting wedding ring will always jog your memory of how beautiful your wedding was. Platinum wedding rings are trendy, stylish and practical. For those who are already married, it is never too late. Just think of it as an investment for you and your lifetime partner. Wearing a ring that is made of something rare, enduring, and pure is already something that can make both of you proud. 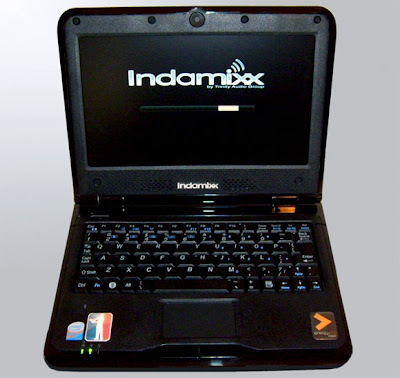 I haven't heard about the Indamixx netbook before, but looking at its specifications/features (and free stuff), this might be a good substitute for my other netbooks or carry-on laptops, especially for audio mixes. It runs Linux OS called Transmission 2.1, with 1.6Ghz Intel Atom CPU for a price of $499. It will be ready for shipping before Christmas if you order it by December 15. To reserve a unit, pre-order it with a $99 deposit. Thanks to createdigitalmusic.com for this info. The Charter’s ultimate service bundle is $165.97 only. But that is not just it. Once you sign-up for the bundle, a gift card worth $250 will be yours. Buying the bundle will also automatically give you the chance to win an X-Box 360 game console. Just imagine what more can you buy from your extra $250 gift card! If you live within the Charter Communications service area, this is the time to think of your current internet, phone, TV provider. This offer is the best price there is available today for such an amazing package. If you want to opt for a much lesser value, you can still get good deals from other Charter’s services: 1 Charter service for $25, 2 Charter services for $75 and 3 Charter Services for $150. But if you really want the best rewards, get the Black Friday /Cyber Monday Charter Communications ultimate service bundle: you just don’t get the best price for 2009, you also have the $250 gift card and maybe win the X-Box!?! For complete X-Box sweepstakes rules go here. 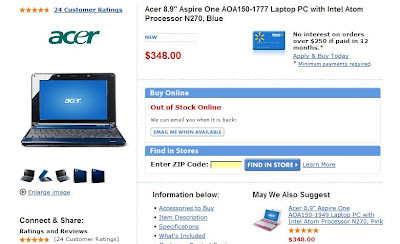 Staples is giving a Black Friday discount to the Acer Aspire One netbook. The special price is $349.98. This is for the blue color only. 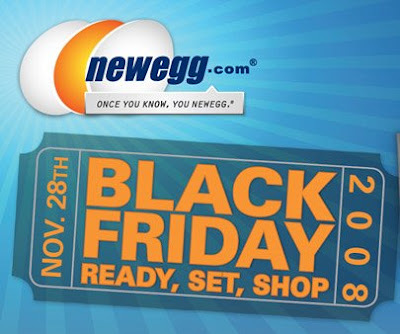 Newegg has revealed a list of their Black Friday deals. Guess what, there is a discount on the 8.9" Acer Aspire One Netbook from Newegg. The price has been dropped to $249.99 from the usual $299.00. There is a Newegg Black Friday newspaper ad after the jump. There are pre-release MSI WInd U120 netbook units out there and few lucky Spanish people were able to get their hands on them. 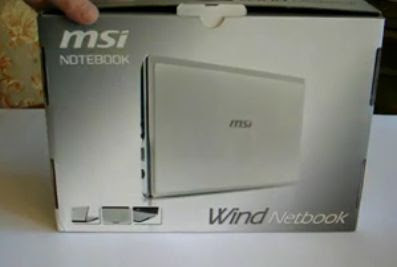 The MSI Wind U120 is a netbook my friends. The box says it all. It is not a notebook, laptop but a netbook! HIS is a company that solely makes graphics card. But not anymore. HIS launches the HIS netbook in Mumbai, India. 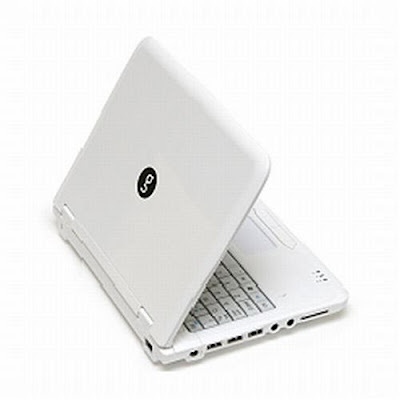 Features of the HIS netbook is similar to most netbooks existing now. But who cares really. Netbook lovers will always want to try a new brand, even if it is not as big as companies like HP, Acer, Dell, Lenovo, and Toshiba. Specifications of the HIS netbook. The last storage capacity released for the Dell Inspiron Mini 9 was 16GB SSD. Now you can have an option of a Dell Inspiron Mini 9 with a 32GB solid state drive. The base price for a Mini 9 with 4GB SSD is $349. If you opt for the 32GB, you have to add $100 more. Amazon's Black Friday deals, no laptop? I am waiting for Amazon to include Black Friday deals for their laptops or netbooks. That will be an amazing idea. People will be trooping to Amazon (and slow down its server) if the laptop deals ever happen. There have been leaks already on items (on games) Amazon might offer this Black Friday 2008. Some of these offers are good through "Cyber Monday". I will keep you all updated for travel gadget deals, specifically netbook deals that Amazon may offer for Black Friday. Qube will be releasing its Qube M1 8.9" netbook in the booming Philippine netbook business. Qube M1 will be available on December 20th, just in time for Christmas when Filipinos get their Christmas bonuses. The Qube M1 netbook will come with 3 options: Linux Mint, Windows XP, and Windows Vista. * Price: Around P16,000 or about $327 US. This post is the follow-up of the "Samsung NC10 unboxing, first part" I posted on Monday. This is a video I took while unboxing the Samsung NC10 netbook. I bought the Samsung NC10 from buy.com for $550 (including tax and shipping). So far, after three days of using it, I am beginning to love it more -- even more than my ACER Aspire One netbook. The 10" screen of the NC10 is perfectly made for my eyes. The keyboard is designed to perfectly fit my fingertips. Really, I may not change netbooks anytime soon. Here is the video I took while unboxing the Samsung NC10. Samsung NC10-14GW 10.2-Inch Netbook (1.6 GHz Intel Atom Processor, 1 GB RAM, 160 GB Hard Drive, 6 Cell Battery, XP Home) White -- Amazon. Samsung NC10-14GB 10.2-Inch Netbook (1.6 GHz Intel Atom Processor, 1 GB RAM, 160 GB Hard Drive, 6 Cell Battery, XP Home) Blue -- Amazon. 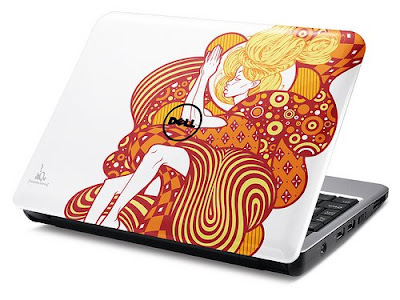 Wanna add a little twist of color to your Dell Inspiron Mini 9 and Mini 12? New designs are revealed. The performance of the netbooks/laptops are still the same, only the outside appearance are changed. 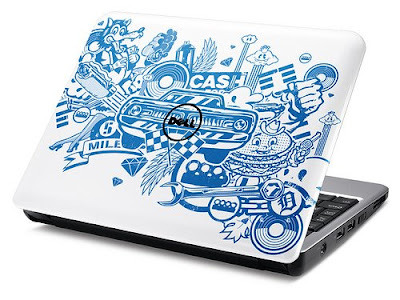 If you want to have these cosmetic designs on your Dell Inspiron Mini 9 and Mini 12, you have to shell out $50 above its asking price. Electronista.com has more of the designs. Finally the Epson Endeavor Na01 netbook is here after a month of waiting and teasing. Based on the specifications, the new Epson netbook is no different than any other existing netbooks in the market today. I am not attracted to buy this netbook. Samsung NC10 has better features with even a comparable price. Epson Endeavor Na01 will be priced at $485. The new Neo Vivid, however, has a wider screen (10 inches) and a bigger HD capacity (160GB). 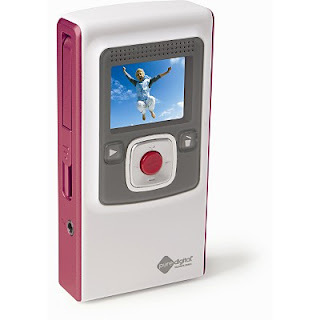 It offers units in 5 colors: white, pink, blue, red and black. Price? About $480. Microsoft released lately the update for the Zune 3.1 that adds 3 new games: Space Battle, SuDoKu, and Checkers. The update also makes some stability and performance improvements, like eliminating some of the lag sometimes seen in the Zune hardware. It is expected today, November 19th, that Microsoft will be announcing a small price cut on the Zune in time for the Christmas holidays or even Black Friday. Price discounts apply only to the flash-based models. 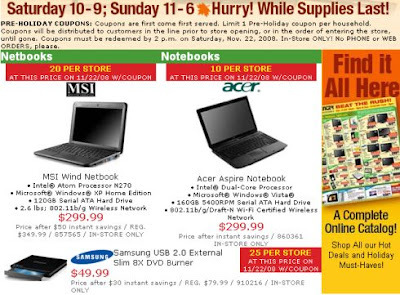 As Black Friday 2008 is fast approaching, Microcenter is having early Black Friday blowout deals for all online shoppers. 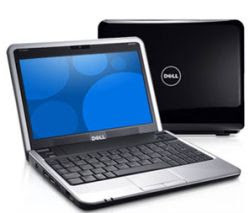 The site has posted laptop/netbook deals for an early grab. After Best Buy sells the Asus Eee PC 900A for $279.99, Microcenter sells the MSI Wind and the Acer Aspire laptop computers for $299.99 each. The MSI Wind U100 has a 10 inch screen, 1024 x 600 pixel display, an 1.6GHz Intel Atom CPU, 1GB of RAM, a 120GB hard drive, 802.11b/g WiFi and comes with a 3 cell battery and runs Windows XP. 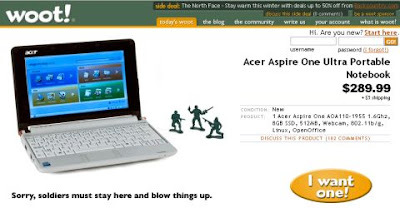 Acer Aspire notebook has a dual-core CPU, 160GB hard drive, and runs Windows Vista. Hurry this Microcenter promo is for this weekend only, November 22. My Samsung NC10 netbook has just arrived few hours ago. I opted for the 2-day delivery option on buy.com, and as promised, delivery was on-time. I already unboxed Samsung NC10, took some photos and recorded a short video. My first impression was...awesome! The cover is not glossy and finger-print free. It also has a 10.2-inch LED superbright non-gloss screen. The keyboard is perfect, about 92% the size of a normal keyboard. Later today, I will be posting the photos plus video. For now, you may want to check out where to buy your own Samsung NC10 unit. Mr. Bluelight brings the great deals only to you! Kmart's 'Mr. Bluelight' lights the store with big bright eyes and welcoming smile that will help you make the most of your Kmart experience. In my effort to find great travel gadgets for you, my readers, I followed Mr. Bluelight inside Kmart's online store and found some amazing electronic stuff, which might be useful for your day-to-day travel. Here is one: the Nextar GPS Navigation System w/ 4.3 in. Diagonal Touch Screen Display. From $180, it is now priced for $120! If you haven't used or tried a GPS before, this is the right time to purchase one. Just imagine what a GPS can do to your travel: it shows you where you are, where you're going and the easiest way to get there! Here is another one: Flip Video Ultra Series 60 minutes. This is good for the kids if you intend to bring them on your trip. Give them something to enjoy their hands and eyes on. Give them this camcorder with one-touch recording and digital zoom. It holds up to 60 Minutes of TV-Quality video on 2 GB of built-in memory; no tapes or additional memory cards required. This will keep the kids behaved all throughout the road trip! Price has dropped -- from $150 to $130. Find Mr. Blue Light and you will find marked-down merchandises in Kmart Layaway program! More travel gadget deals soon! Black Friday is more than a week from now, but people are starting to find the best Black Friday deals. It always is good to plan ahead, isn't it? One of the shops you might wanna check is OfficeMax. Their Black Friday deals have leaked already online. More deals will come soon. Walmart Black Friday 2008 laptop deals? If there will be a Walmart Black Friday 2008 deals on netbooks (I think they have the ACER Aspire One) and laptops, I will be the first one to be on the line. Since netbooks/laptops are most likely the items people will look for this coming Black Friday, Walmart may not put the idea aside and join the fray -- give out big discounts on their items. Among the most heavily discounted electronics items poised to dominate this year's sales are low cost notebooks, according to analyst Ben Reitzes, who notes that Dell plans to offer $299 linux model via its website, while Wal-Mart markets a $299 Compaq, and Best Buy a $299 eMachines portable. Ultra-low cost notebooks will be a major draw this Black Friday as vendors look to push volumes and consumers look to trade down given the economic environment. So Walmart may have a $299 Compaq deal this Black Friday. Is this the 15.4" Compaq units that they are selling for $500-$600? Wal-Mart is not expected to officially unveil its Black Friday deals until Nov. 24. Wal-Mart's so-called doorbuster deals offered between 5 a.m. and 10 a.m.
Dell Inspiron Mini 12 comes to the U.S. There's the Dell Inspiron Mini 9 and there is this Dell Inspiron Mini 12. The latter is now available in the U.S. for a price ranging from $549 to $649. The lowest price for Dell Inspiron Mini 12 will have a 1.33GHz Intel Atom Z520 CPU, 1GB of RAM, a 40GB HDD, and a 3 cell battery. The higher end will have a 1.6GHz Intel Atom Z530 CPU, a 60GB HDD, and a 6 cell battery. Would you buy the Dell Inspiron Mini 12 (that's with 12" screen)? It is still small in size if you ask me, though not that small compared to other netbooks. Sears - Big One Day sale! Sears, one of the biggest department stores, is offering great deals for their products this weekend, November 15, for their Big One Day sale specials. This is the best time to buy your travel gadgets and avail of big discounts. I was browsing for some interesting stuff and found these two items that I recommend buying. If you need to buy the Canon Powershot (with 8.0 megapixel, 4X optical digital zoom, still camera), visit sears.com. The Canon Powershot is priced at $149.99, but during the 3-day sale, you will get a $30 instant savings. That is a big saving you will never get from other stores. You may want to buy this too. I bought one recently and it is so classy. I was able to view easily and quickly digital pictures from my travel using the memory cards, minus the PC or printer. Price is only $39.99. These are just a few of the deals I spotted. Remember the date: November 15th. It’s the Big One Day sale, doorbusters from 7:00a.m. to noon only! Best Buy is cutting its netbook prices. The Asus Eee PC 900A price is now down to $279.99 from $299. 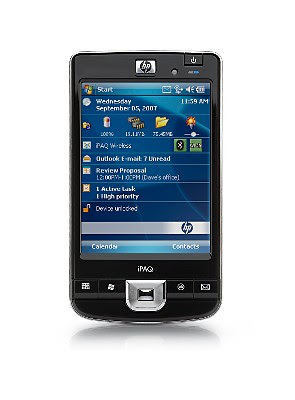 Features a 533MHz frontside bus, 512KB cache and 1.6GHz processor speed. Optional external DVD-ROM drive available (not included). With 1024 x 600 resolution showcases movies, games and other images. Offers quiet, energy-efficient and shock-resistant storage and fast read/write times. For lush images. High-definition audio support with 2 built-in stereo speakers. Supports Secure Digital and MultiMediaCard formats for easy digital photo transfer. Lets you wirelessly connect to the Internet. Finally! I have been waiting for my order of Samsung NC10 netbook. Buy.com is now shipping the Samsung NC10 in the U.S. I am expecting that other sites like CDW.com will follow suit as I ordered mine from them. I would have wanted to cancel my order and purchase one from buy.com. But I had second thoughts. Maybe I just have to wait for few more days. The Samsung NC10 is priced for $499 at buy.com. At CDW, I paid like almost $550 including the tax and shipping. If you can wait for more weeks, Amazon is offering a much lesser deal at $488, and that includes everything. Amazon also offers free shipping for the item. Samsung NC10-14GW, 10.2-Inch Netbook (1.6 GHz Intel Atom Processor, 1 GB RAM, 160 GB Hard Drive, 6 Cell Battery, XP Home) White -- Amazon Store. Save $50 this Black Friday for the Dell Inspiron Mini 9. Dell is putting the Dell Inspiron Mini 9 on a sale, according to their Black Friday ad. It is now priced at $299. 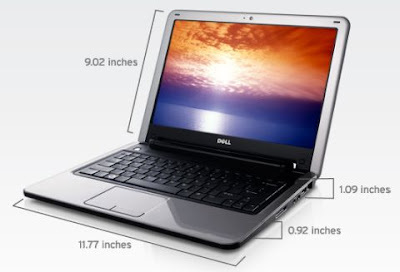 You can read more of the specs of the Inspiron Mini 9 here. I was having my usual routine at Walmart, checking on new electronic stuff on the shelf when I noticed a netbook placed side by side with other much bigger laptops. It's the Acer Aspire One, blue color. It was the first time I saw the blue version and to tell you frankly, I like the dark shade of blue. It was not so fancy-looking yet even classy to some extent. I checked Walmart online and found out the they are also selling it for the same price. The white version is out of stock though, as of this writing. The blue color is available and ready for purchase. Netbooks meet-up in Germany -- yeah! Eee PC News and Eee PC.de hosted a meetup in a coffee shop in Germany and someone recorded this video that shows a number of netbooks. It is like the shop has been stormed by ultraportables! Kmart is offering a layaway program for the holidays. If you are thinking of buying stuff online, like the iPAQ 211 Enterprise Handheld, think of this opportunity from Kmart. I think this is a chance for those who cannot pay in full at one time. In any type of layaway program, there will be a regular layaway payment until you have covered the total purchase price of the merchandise. The iPAQ 211 Enterprise Handheld is a powerful device that will run work applications and a broad range of third-party solutions. It also has a large touch screen for excellent viewing in a variety of light conditions. With its internet and e-mail capabilities, you can access your online data wherever you are: at the office or in Wi-Fi hot spots like airports or cafes. Why iPAQ 211 Enterprise Handheld? To get you own unit via Kmart Lay-Away plan, you have to undergo 4 easy steps. 2. Bring the item to the layaway counter and make a downpayment. Downpayment is about 10% of the price. 3. Pay your layaway due every two weeks. 4. Take home your item once the last payment is done. That’s about it. Please allow 3-4 days for your item to arrive. 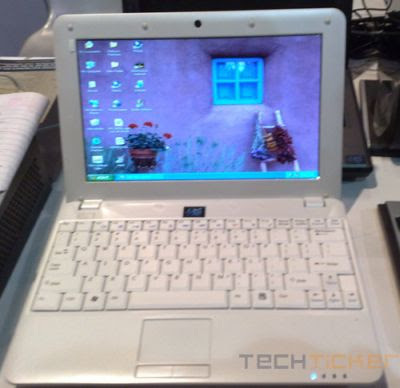 This is the cheapest, the best price deal for the Asus Eee PC 1000H! Newegg is selling the unit for $339.75. 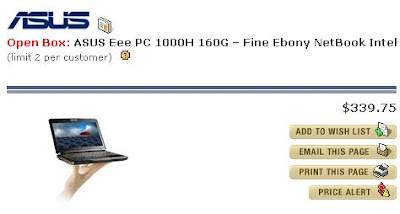 Months ago Asus Eee PC 1000H was selling over $500, then went down to around $450. This time, it went further down and with the nice specs of this Asus unit, you might want to give it a go and buy it. Snow storm in Brookings, South Dakota, again?! Since yesterday afternoon, South Dakota has been stricken by a snow storm. It is the first snow storm of the season in SD and for the United States. The reports said that some areas could be without power for days. My gully! No heating system inside the house could freeze me in hours. A long stretch of Interstate 90 was closed. Some motorists have been stranded for more than 24 hours and search teams can't get to them because of zero visibility. The storm has dropped 45.7 inches of snow near Deadwood, in the northern Black Hills. Reports of 10 inches to 2 feet of snow were received from many West River counties. In some towns, residents reported drifts were blocking their doorways, and in the southwestern corner of the state, 20-foot snowdrifts were reported on the Pine Ridge Indian Reservation. Alright, time for me to shovel the snow. 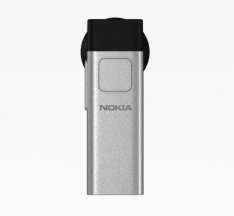 Nokia has revealed its smallest bluetooth headset BH-804. This is what I call small but terrible - a small size with huge power. 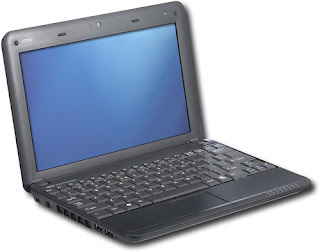 I have never seen this netbook before: Sylvania GNET28001SN Meso 8.9". As I was browsing Amazon for great deals, I stumbled upon the Sylvania Meso 8.9". The netbook seems to have the essential features that one expects for an ultraportable PC and even comparable to other netbooks existing today. The price is very affordable too ($370) for a lightweight netbook (just touches 1kg). 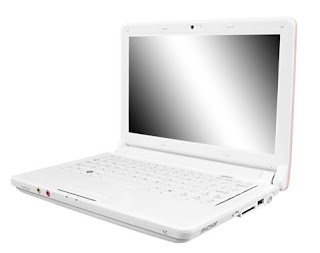 You can check it out or buy it from Amazon: Sylvania GNET28001SN Meso 8.9" Netbook PC (1.6 GHz Intel Atom Processor, 1 GB RAM, 80 GB Hard Drive, Ubuntu OS) White. After the HP 2133 Mini-Note and the ACER Aspire One, MSI Wind U100 follows suit by lowering its price to $350. Best Buy is offering the MSI version with Intel Atom Processor N270, Black color. The Hasee Europe site has posted a new netbook, the Hasee MJ125, from the Chinese computer maker Hasee. The netbook is only available in Europe with a price of 370 Euros (about $470). You can buy the Hasee MJ125 10" netbook from ebay. Sprint HTC Touch Pro is now available for purchase online only at select national retailers. The retail price of the QWERTY smartphone is $579.99. However, there is an "instant savings" of $180 and a $100 mail-in-rebate. 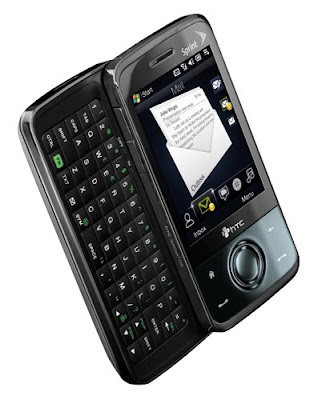 Eventually, you are only paying an affordable $299.99 Sprint HTC Touch Pro. The Flip Video Mino Camcorder must be one of the gadgets you should consider buying this holiday season as a gift for your loved ones. 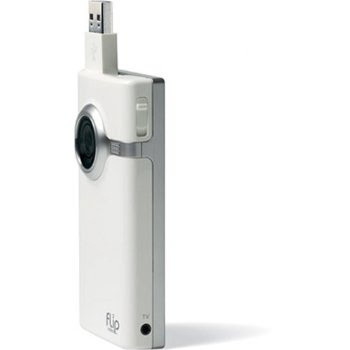 This is one remarkably great flip cam that fits your pocket because of small rectangular shape. It is one of the most sought-after gadget this season. The super-portable, super-simple Flip Video Mino makes it easy to capture and share high-quality video anywhere and everywhere. Amazon Store is slashing 13% of the original price. Wanna see and buy the Flip Video Mino Series Camcorder? Check it out: White Color and Black Color. You can buy the Acer Aspire One for $289.99, but for today only at Woot.com. This is the cheapest you can get for the Acer netbook. Online stores sell this for $320. This $289.99 model has an 8.9 inch, 1024 x 600 pixel display, a 1.6GHz Intel Atom CPU, 512MB of RAM (upgradeable to 1.5GB), an 8GB solid state disk and uses Linpus Linux Lite operating system. If you are up to it, grab it now.